While we prepare our mummy Wilfred/a to be x-rayed, we are simultaneously working on fragments of cartonnage that may belong to the him/her. There are 35 pieces, some of which are assemblages of multiple fragments mended together, plus some very small fragments in a ziploc bag. 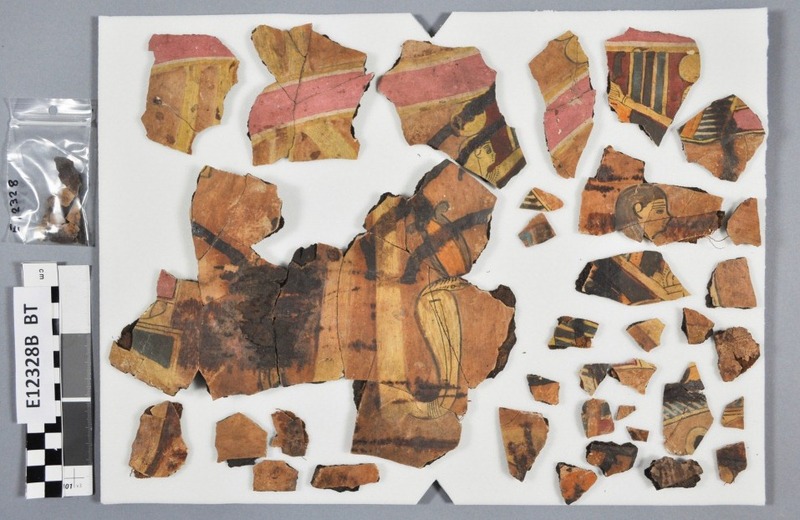 It is unclear what these fragments originally belonged to. They definitely do not make up an entire object, and they are mostly flat. We can see that there are at least 3 figures depicted in the painted decoration, but we’re still in the process of trying to piece together the rest of the design, and trying to figure out which pieces join together. 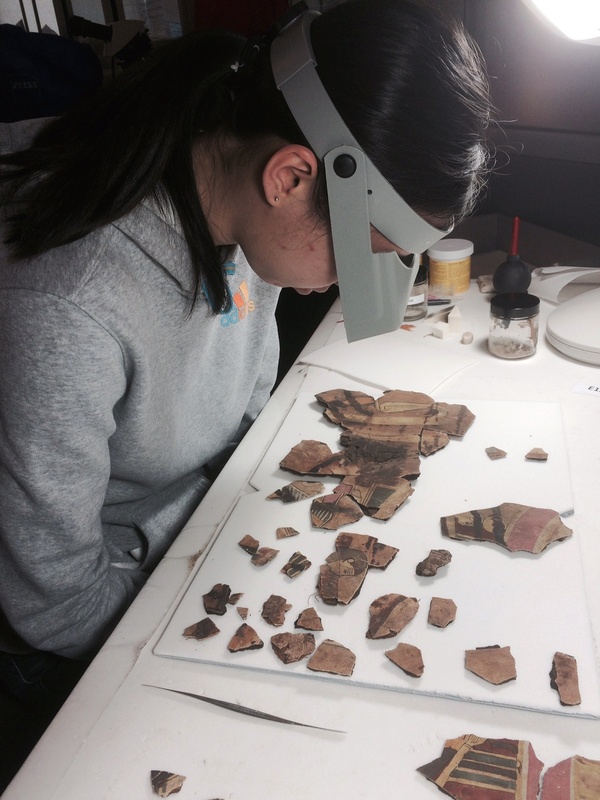 Pre-program intern Yan Ling examines the cartonnage fragments with the aid of an optivisor. Yan Ling, our pre-program intern and an art conservation undergraduate from the University of Delaware, is helping me document the fragments. As part of our examination process, we will be looking at the fragments with our Mini Crimescope, and we’ll post anything interesting that we find on here soon. 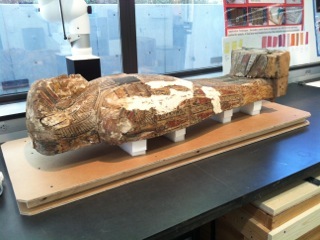 Sometimes getting started on a conservation treatment requires getting out of the lab for a bit, so this week, my colleague Julie Lawson and I took a field trip down to Baltimore to visit the Johns Hopkins Archaeological Museum and chat mummy treatments with their Curator/Conservator, Sanchita Balachandran. Sanchita and I connected at the American Institute for Conservation (AIC) annual meeting back in June – I had read about a treatment that she carried out on a human mummy at the museum, and when we realized that we both had animal mummies in our labs as well, we decided we’d get together for a brainstorming session to discuss treatment approaches, materials, and storage options for these fragile objects. 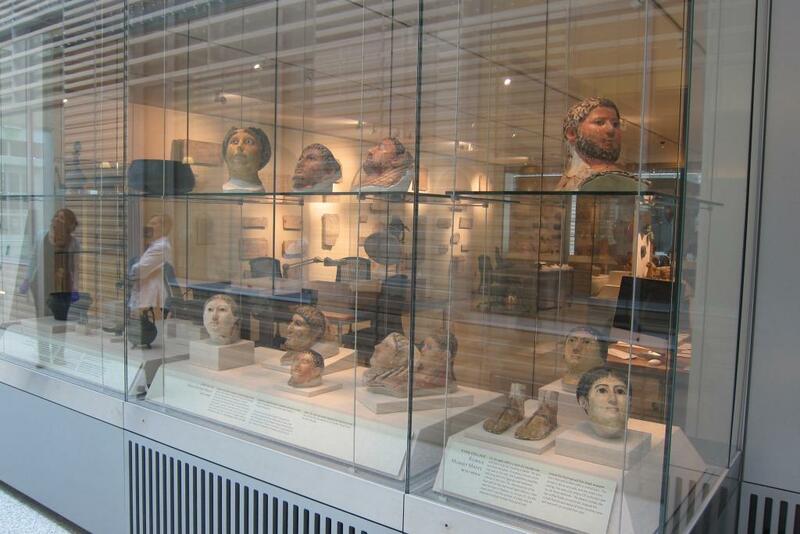 The Johns Hopkins Archaeological Museum is nestled in the center of the Johns Hopkins Homewood Campus in Baltimore, in a beautifully-renovated building, surrounded by classrooms and light-filled student study spaces. The museum was established in 1882 and since its founding, has been dedicated to inspiring and teaching students at the university. 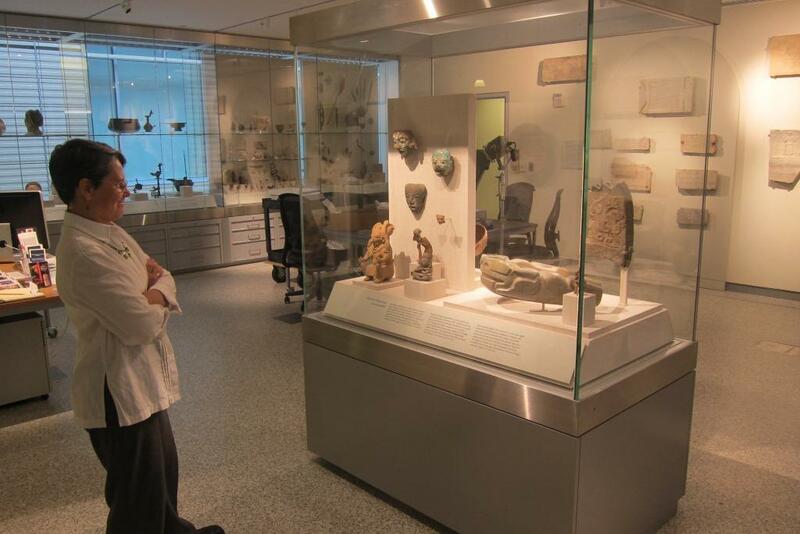 One of the main features of the museum is the display of archaeological objects from ancient Greece, Rome, Egypt, the Near East, and the ancient Americas, displayed in glass case walls, allowing students, faculty, and visitors to view these pieces and peer into the museum itself. 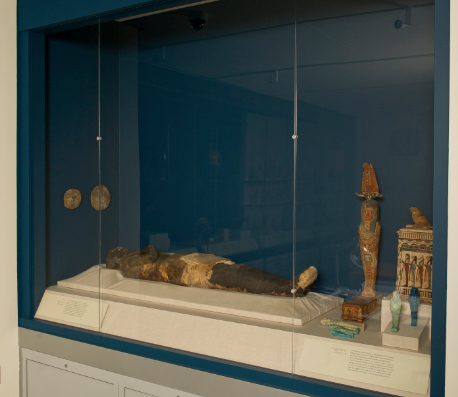 The museum also displays pieces on loan, including an ancient Egyptian mummy from Goucher College. 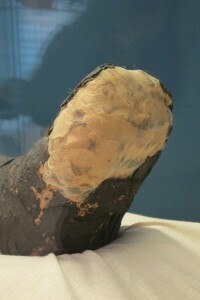 This was the mummy that I had read about and was curious to learn more about from Sanchita. The Goucher mummy is an adult female mummy from the Ptolemaic Period (305-30 BCE), and I knew some details of the treatment from Sanchita’s article in the Journal of the American Institute for Conservation (JAIC), but this was a great opportunity for me to see this mummy up-close and to ask Sanchita more about how she approached this treatment and the specific materials and techniques she used. Since we are in the middle of working on the treatment of our mummy PUM I here in the Artifact Lab, this conversation was very timely. 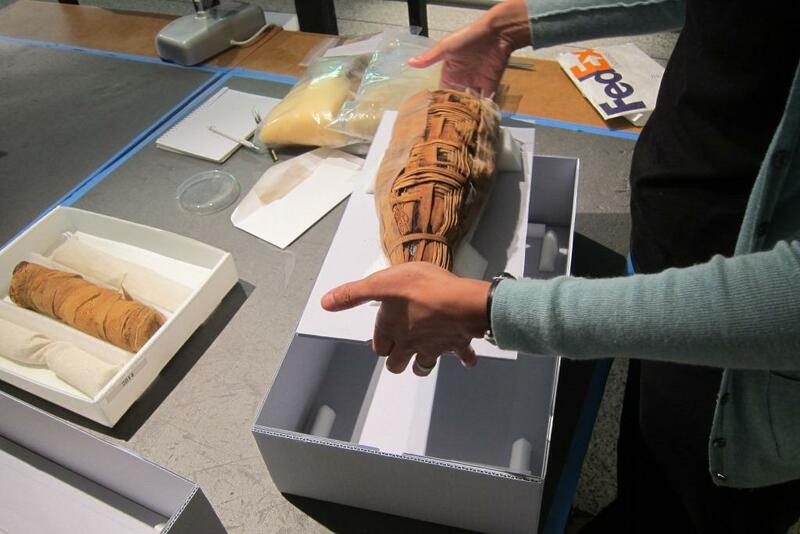 The Goucher mummy has a fascinating history that I won’t get into here, but you can learn more about her in the “Object Stories” section of the museum’s website by following this link. One of the things I was curious to discuss more with Sanchita was her use of Stabiltex, a sheer polyester fabric, to protect fragile areas of the mummy’s wrappings, and the design and construction of the support the mummy is currently resting on in the exhibit. As I said, we’re working on encapsulating PUM I’s outer linen wrappings in a similar way, but using a different type of sheer netting fabric. After discussing techniques with Sanchita and seeing how successful her treatment of the Goucher mummy was, I returned to the Artifact Lab feeling good about our approach to PUM I’s treatment! We discussed the challenges of dealing with such fragile linen wrappings and our experiences with and use of different adhesives, as well as techniques for encapsulating fragile areas. 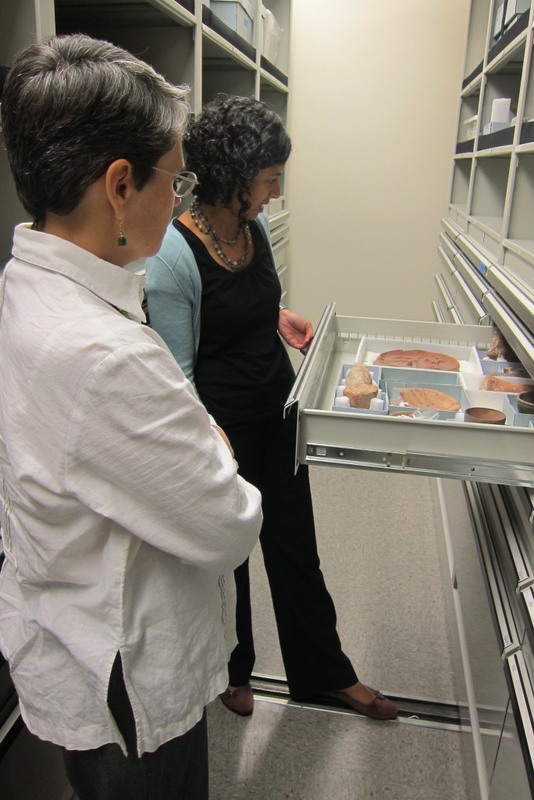 Sanchita also showed us their handling and storage mounts, which go a long way in protecting these artifacts. After discussing mummies at length, Sanchita took us back into their storage area, where we had the opportunity to see additional Egyptian artifacts, including several painted wood artifacts with a variety of condition problems. 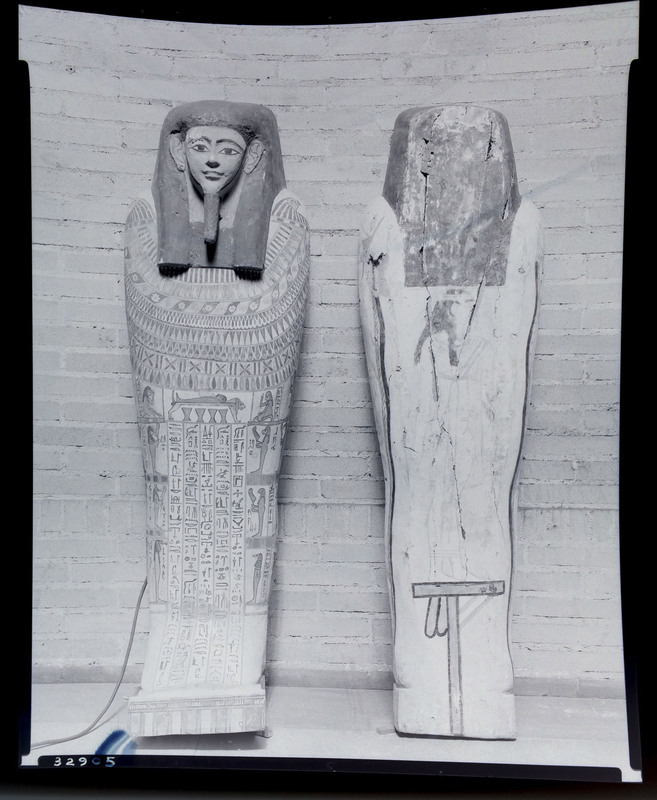 As readers to this blog may know, we have our own fair share of challenging painted wooden artifacts, including Tawahibre’s coffin, so I was eager to see how Sanchita was approaching the treatment of these pieces as well. All in all, it was a fun and productive day! These types of professional exchanges are incredibly valuable, and I’m not only inspired to tackle some treatments and try new things back in the lab, but to make more time in the future to visit other colleagues and collections. A huge thanks to Sanchita for hosting us and for sharing so much about her work at Johns Hopkins. 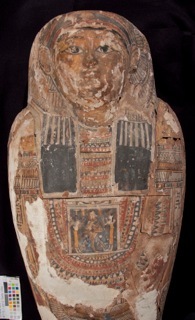 Now, all of our mummies are special, but this child mummy has several qualities that make her particularly endearing. 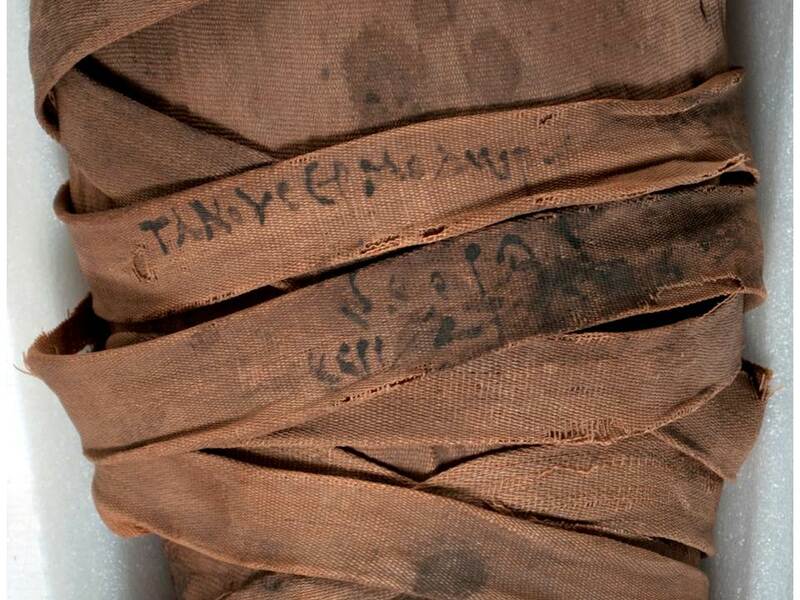 One of the things that we really love is that her name is written on her wrappings, near her feet. Her name is actually written in both Greek and Demotic – Demotic is the language/script that developed in later periods in Egypt (and is one of the languages inscribed on the Rosetta Stone, along with Greek and hieroglyphic Egyptian). In Greek, this inscription reads: “Tanous (daughter of) Hermodorus”. In Demotic her name reads as “Tanwa”. So, based on this inscription, we know that she dates to the Ptolemaic Period, and that she is a girl. According to our Egyptologists, what is interesting about the names is that they give a good indication of the multi-cultural nature of this time period. Not only in the fact that 2 languages are represented, but that the girl’s name incorporates the name of an Egyptian goddess, Iwnyt, while her father’s name includes the name of a Greek god, Hermes. Tanwa has been CT-scanned, which has confirmed the fact that she is a girl, and was likely right around the age of 5 when she died. 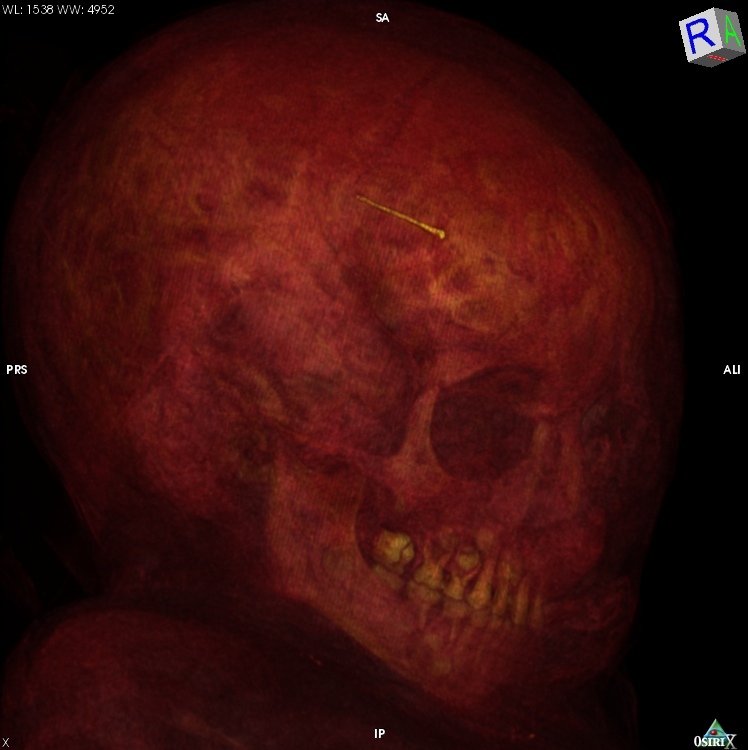 Here is a still from the CT scan showing a detail of Tanwa’s skull. Based on her teeth it has been estimated that she was about 5 years old when she died. 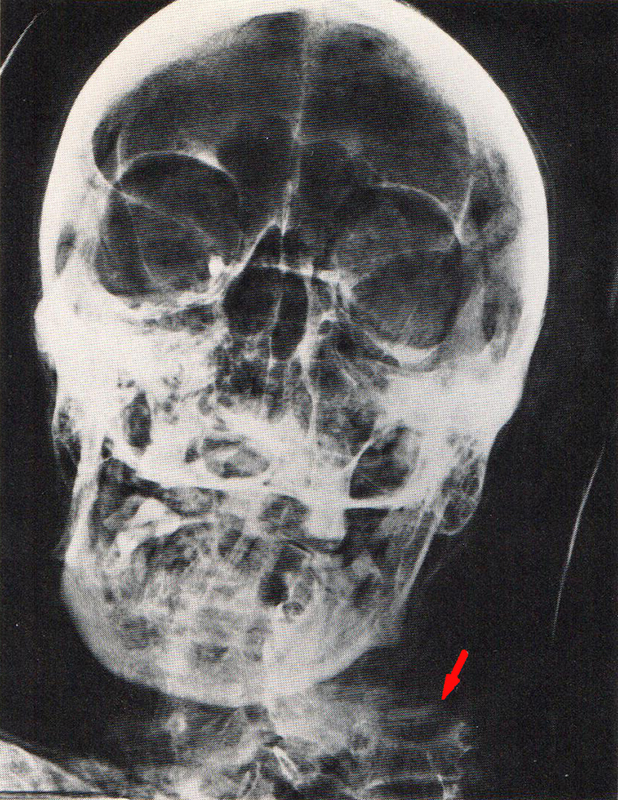 That pin you can see near the top of her skull is modern and not actually in her skull-it was used to secure the outermost layers of linen in that area. 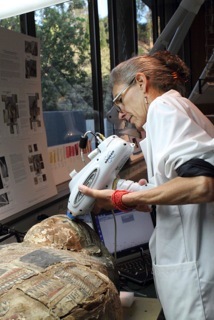 One of my favorite things that CT scanning has shown is that she is wearing 2 bracelets on her left wrist. We are guessing that these might be gold. 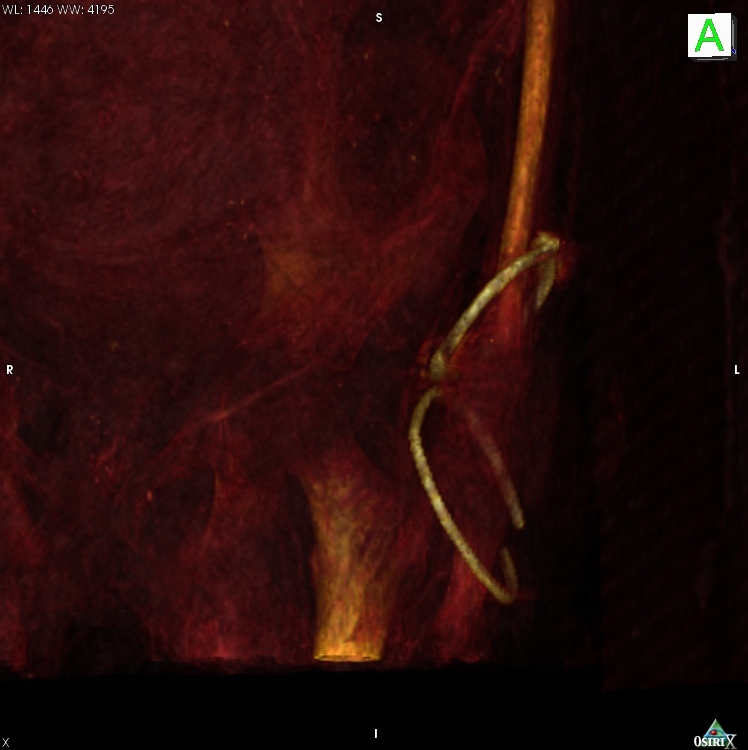 Two bangle bracelets on the left wrist show up clearly on the CT scan. She also has a small metal ball included in her wrappings just over her right tibia. Exactly what this is and why it was placed there is a bit of a mystery. A detail shot of the metal ball near her right tibia. 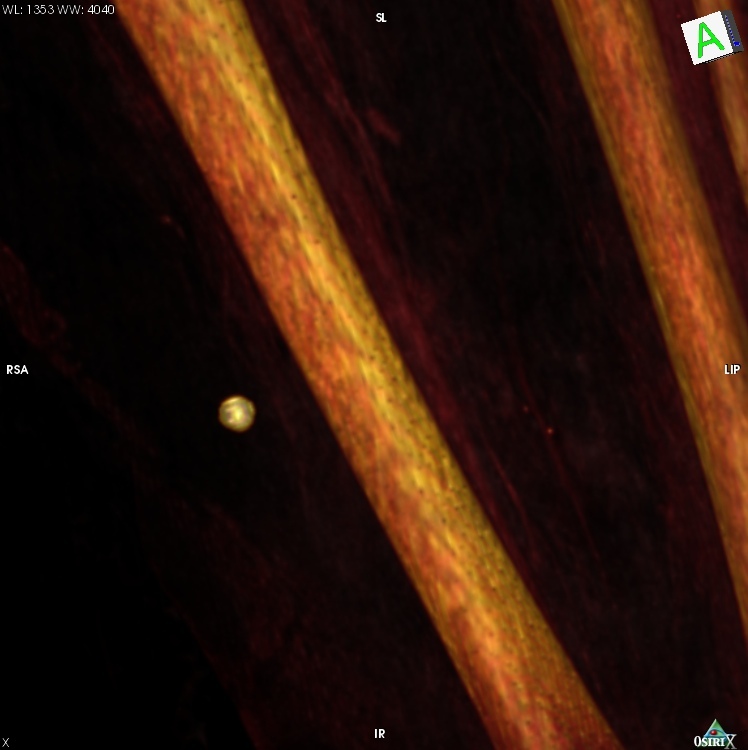 There is a lot more we can learn from these CT scans, which I will describe in a future post. 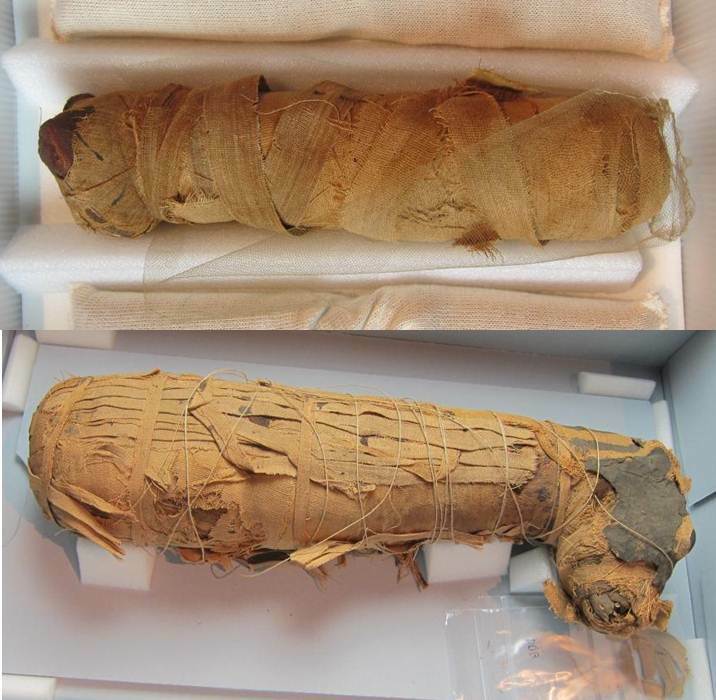 Fortunately, Tanwa is in fairly good condition; one of the main issues that we need to address here in the conservation lab is that many of the narrow linen bands wrapped around her body are fragile, torn and partially detaching. I am currently more than halfway through the conservation treatment, and I will provide a thorough report on what we are doing to stabilize her wrappings next. Stay tuned!